Have you read all the best Excel programming books? Do you know how the Excel object model works? Are you familiar with macros and worksheet design techniques? Do you still have difficulty translating your knowledge and experience into comprehensive Excel applications? 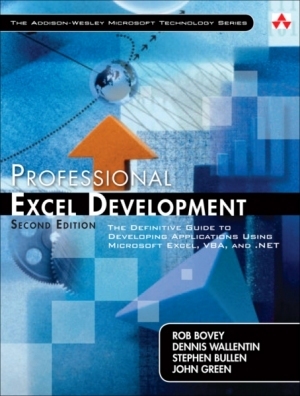 If so, Professional Excel Development is the book for you. Professional Excel Development doesn't waste time explaining what you already know about Excel. It starts where other Excel books leave off and builds on the techniques you already know to demonstrate how professional Excel programmers create commercial quality Excel applications. Professional Excel Development is more than just a theoretical guide to the concepts and techniques employed by professional Excel developers. As the book progresses, we build a fully functional, professional-quality timesheet reporting and analysis system that illustrates the concepts and techniques introduced in each chapter. Chapters 1 to 3 provide an introduction to professional application development with Excel, explain the different styles of application we might choose to create for different circumstances, and identify some general best practices for working with Excel and VBA that will be followed throughout the book. Chapter 4 explains how to design and structure worksheet user interfaces for data entry and analysis. Chapters 5 and 6 introduce two specific types of application - the add-in and the dictator application, which will form the basis of our timesheet reporting and analysis application. Chapter 7 introduces the use of class modules in our Excel applications. Chapters 8 to 11 discuss XML, command bar and Ribbon user interfaces, and designing applications that must run in all current versions of Excel using a single code base. Chapters 12 to 17 discuss advanced techniques for a range of VBA topics, including UserForm design, interfaces, error handling, debugging and performance optimization. Chapters 18 and 19 cover database development for Excel developers. Chapters 20 and 21 explain how to efficiently use Excel’s built-in charting and data analysis features to analyze data and present results. Chapters 22 to 27 look outside of Excel, by explaining how to automate other applications and extend Excel with VB6, VB.NET and C.
Chapter 28 focuses on how Excel applications can make use of Web Services. Chapter 29 completes the development by explaining how to provide help for, secure and deploy an Excel application. Order Professional Excel Development Now!